Celebrate tonight with the Bear Hunters! There's something very satisfying about taking the DIY approach. And that's exactly what Mitchell Sirie and his bandmates in The Bear Hunters have done in preparation for their debut CD release tonight at the Canadian Night Club. There's something very satisfying about taking the DIY approach. And that's exactly what Mitchell Sirie and his bandmates in The Bear Hunters have done in preparation for their debut CD release tonight at the Canadian Night Club. The story behind the album, Eternal Hibernation, began back in 2009 when Sirie came together with Johnny Belanger, Justin Lam, Nik Deubel, and former guitar player Andres Duchesne to share song idea and collaborate. The boys spent an entire year practicing and writing before hitting the Sault stage for the first time. They quickly amassed a loyal following in the local metal scene and decided to lay down their first 10 original tracks on CD. Things didn't go entirely as planned, and the final product being released this evening has been three years in the making partially due to a voice that kills computers. "We tried first recording in my garage and my laptop exploded. Not literally, but it definitely died," Sirie told SooToday.com. "The joke is that Nik blew it up. He was in the middle of an epic scream, and that killed it. It was done." The Bear Hunters then turned to James White and his studio, White Wreckords, to record the album. "It was his first recording and our first recording, so it was kind of a labour of love," Sirie said. "He did a great job and we both learned a lot from the experience." Under his own, newly formed label, Edge of Eden Productions, Sirie mixed and mastered Eternal Hibernation, and has been busy reproducing, printing and assembling each CD package by hand. "No one's going to sign our band right now without any music out. So, I figured I'd just do it all myself," he told us. "It looks very professional for something that I put together myself." 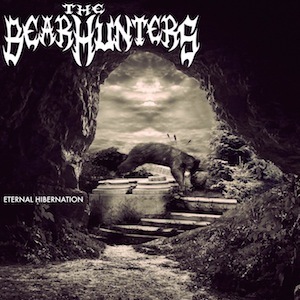 Copies of Eternal Hibernation will be available to the public tonight (Saturday, November 29) at the Canadian Night Club as The Bear Hunters play two one-hour sets of original material along with special guests Haggith and Livid and the Bloodthirsty. This all-ages celebration kicks off at 10 p.m. and admission is $7 at the door. For everything Bear Hunters, please click here.